The Sailor's Moan for the Loss of his Love, artist unknown, date unknown, Lewis Walpole Library. Through a dull rhyming scheme, the poet of The Sailor's Moan tells the story of an unfortunate tar returning home from the 1741 Battle of Cartagena to find that the women he loved has married "a rich old Miser for life." It is such a poorly crafted piece that the printer ran out of paper on the tenth stanza and so had to write in the last word of the third line by hand. 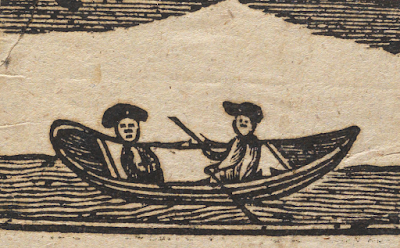 The stilted prose is nothing to write home about, and neither is the primitive woodcut atop this broadside. 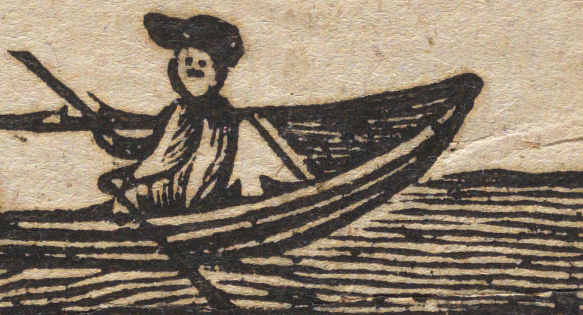 A sailor rows another figure in a small boat. The details are so sparse that I'm not entirely sure if the figure on the left is male or female, much less what occupation they might hold. The oarsman appears to be in shirtsleeves and wears a barge cap of the jockey style. Given the quality of this engraving, those conclusions are certainly open to challenge. Perhaps this can serve as something of a Rorschach test for the examination of sailor's clothing. What do you see?